Click here to download gujarati font. zazi.com is enabled with dynamic fonts so you don't need to install any fonts. It's a internet explorer and Netscape compliant. Once you press 'yes' , re-fresh your browser. You will see page in gujarati. 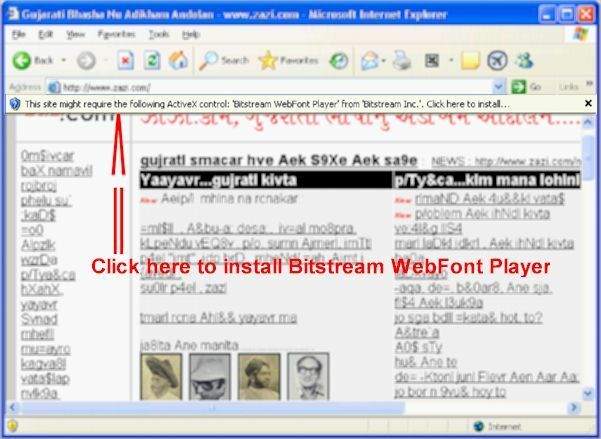 If you are Netscape user this might no happen and you can see the content in Gujarati. If you browser blocks the POP-UPS for example with Internet explore you might want to click on yellow POP-UP Blcok line as shown in below picture. Still if you can not see zazi.com content's in Gujarati then follow the following step and install the fonts.
. Click here , on this line and download the font.
. Save Hitarth.zip file to c:\temp or any local directory you like.
. Once file get save , Go to c:\temp or from your selected directory and open Hitarth.zip file or Just click on Open button as shown below.
. Press extract button (button # 5 from above figure ) and extract file in c:\temp directory.
. Now click on Start Button (Lower Left Button of your computer ) and then click on Control Panel. .You will see following screen, Double Click on Fonts icon.
. Select font from c:\temp directory. You will see Hitarth Guj Preyar Normal Font in List of fonts window. Select that font and press on OK button.
. You will see 100% font install. The font is install now, In case you see same page with junk characters try to re-fresh your browser. Please check your security level for ActiveX control. Welcome to zazi.com,Please download Gujarati font from zazi.com, Send your poems, short story and write-ups in MS-Word/text/gif/jpeg format. Keep up the good work and enjoy Gujarati.